The Moogerah Passion Play is produced by the Moogerah Passion Play Association Inc. a non-denominational association established in 1993. The play is presented at the Lake Theatre, beside the waters of Lake Moogerah in Southern Queensland, Australia. 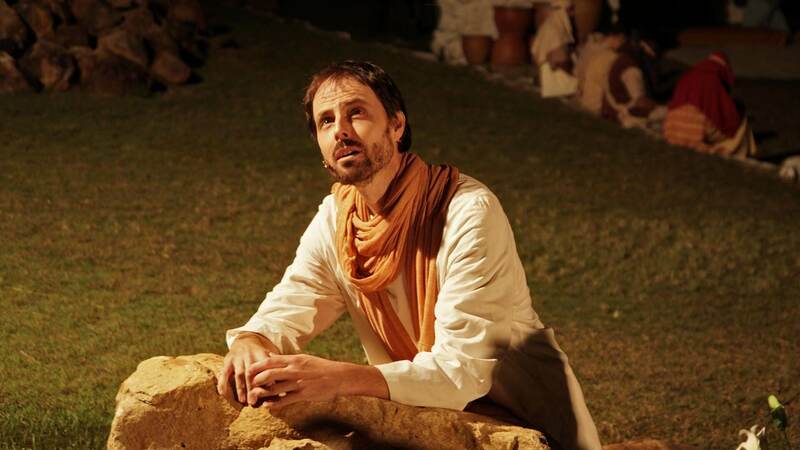 The play has a primary aim of telling the story of Jesus. Up to 100 people are involved as cast and crew to bring the story of Jesus Christ to life and around 3 000 people attend the performances each year. Using drama is just one way of telling the story of Jesus. Drama has been used for many centuries and was used in medieval times as a way of telling Bible stories to people who were mostly illiterate. We use drama as it allows an audience to experience a visual re-telling of his story as it takes on flesh before their eyes. Yet more than that, by using drama, many who come and see the play will understand the central truth of the good news (that’s what Gospel means) that Jesus of Nazareth is the Son of God who came so all who believe in him can have eternal life. We call the play a passion play. Traditionally, passion plays deal only with the period from the day Jesus road into Jerusalem on a donkey to the day of his resurrection. The Moogerah Passion Play, however, deals with events from before and after that period. We present the play close to Easter as that is when Christians around the world remember the crucifixion, death and resurrection of Jesus Christ. We strive to portray the Jesus of the Bible. This requires us to have careful regard to scripture and to the often overlooked fact that the story we portray took place in a Jewish community and that Jesus himself was born and raised as a Jew. Our one aim is to present the story as faithfully as we can without regard to doctrine. That means that what you will see may be very different from the common understanding of what happened. For example, most people think Jesus and his disciples sat at a table in the way portrayed by Leonardo Da Vinci in his painting of the Last Supper. We do not present it the way but rather recognise it as a Passover meal where people reclined at table. Our hope is that by coming to see the play, you will look at the story of Jesus with new eyes.